15.5 MM profile, EUROPEAN PATENTED, extruded in the USA and finished with a clear anodized coating. The printed SEG panel is produced using our DELUXE KNIT fabric. There is no back panel this frame is WALL MOUNTED. Graphic is completely dye sublimated in full color. One tool (included) is all that is necessary for simple quick assembly. 40 MM profile, EUROPEAN PATENTED, extruded in the USA and finished with a clear anodized coating. 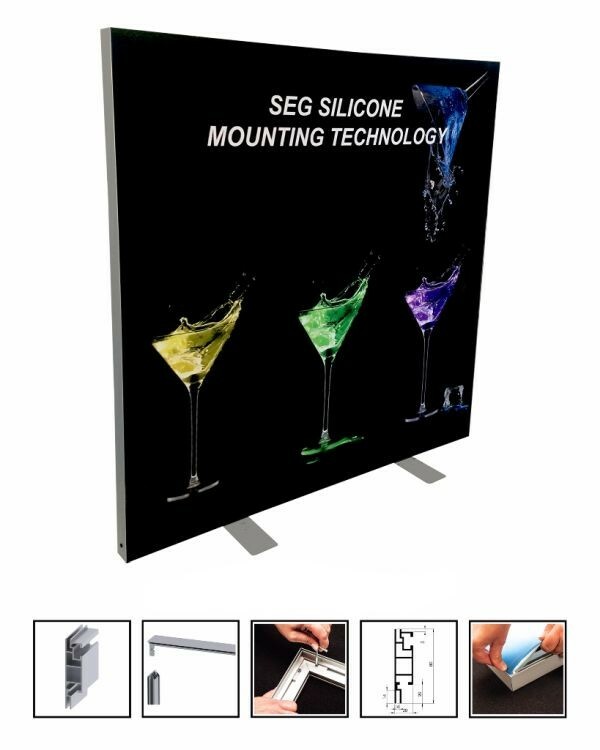 The printed SEG front panel is produced using our POLYPOPLIN fabric. The back panel is white or black POLYPOPLIN fabric. This frame can be WALL MOUNTED, FREESTANDING OR HANGING at the POINT OF SALE. Graphics are completely dye sublimated in full color. One tool (included) is all that is necessary for simple quick assembly. 15.5 MM profile, EUROPEAN PATENTED, extruded in the USA and finished with a clear anodized coating. The printed SEG panel is produced using our POLYPOPLIN fabric. There is no back panel this frame is WALL MOUNTED. Graphic is completely dye sublimated in full color. One tool (included) is all that is necessary for simple quick assembly. 40 MM profile, EUROPEAN PATENTED, extruded in the USA and finished with a clear anodized coating. The printed SEG front panel is produced using our DELUXE KNIT fabric. There is no back panel. 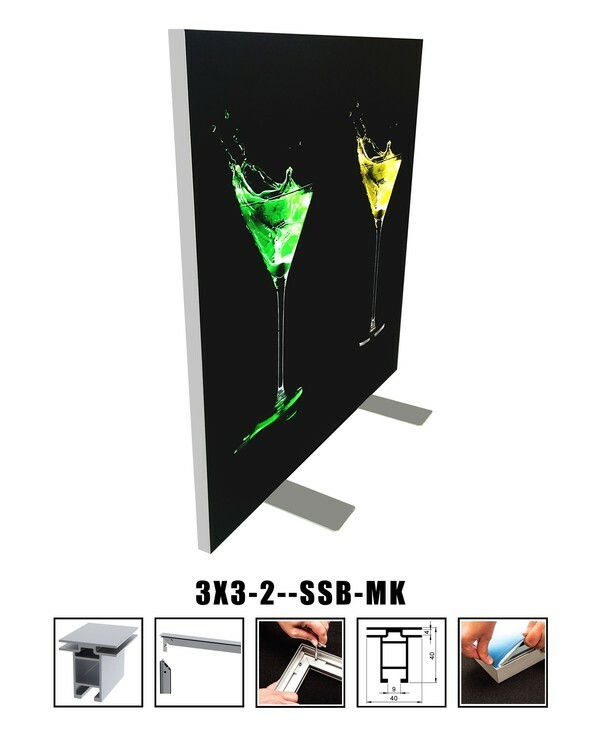 This frame can be WALL MOUNTED at the POINT OF SALE. Graphics are completely dye sublimated in full color. One tool (included) is all that is necessary for simple quick assembly. 40 MM profile, EUROPEAN PATENTED, extruded in the USA and finished with a clear anodized coating. The printed SEG front panel is produced using our POLYPOPLIN fabric. The is no back panel. 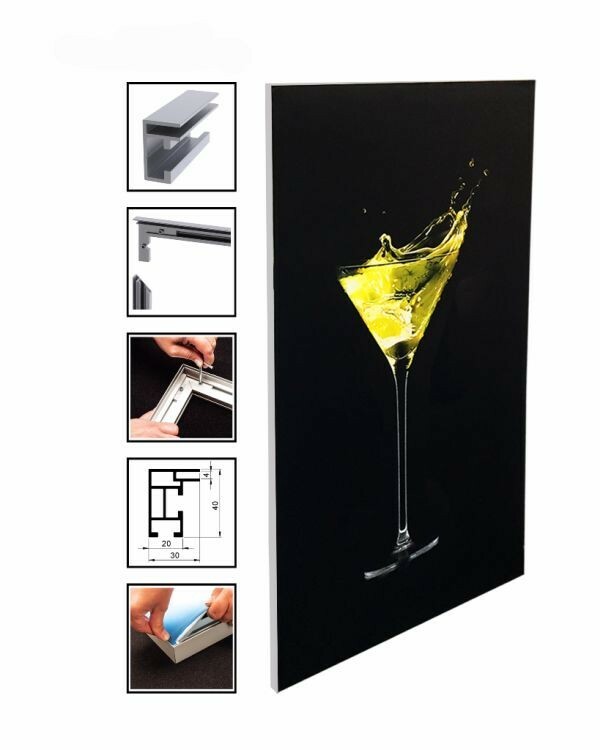 This frame can be WALL MOUNTED at the POINT OF SALE. Graphics are completely dye sublimated in full color. One tool (included) is all that is necessary for simple quick assembly. 40 MM profile, EUROPEAN PATENTED, extruded in the USA and finished with a clear anodized coating. The printed SEG front & back panel is produced using our POLYPOPLIN fabric. 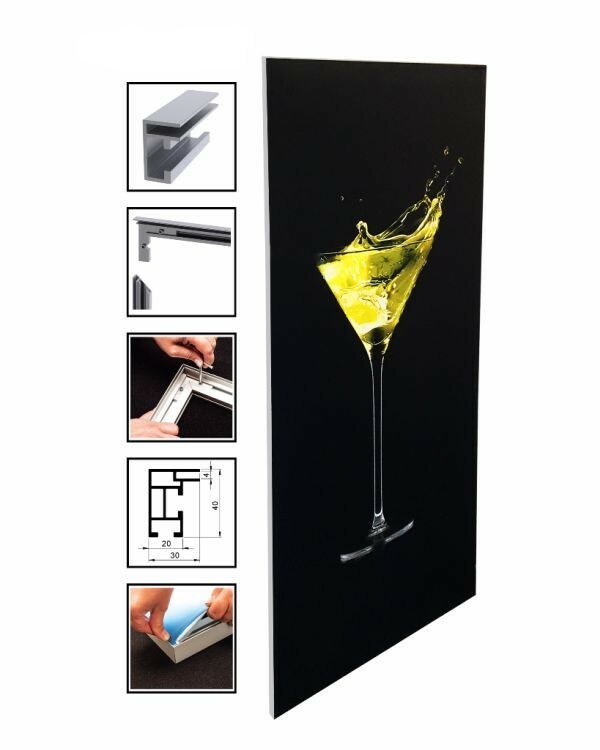 This frame can be WALL MOUNTED, FREESTANDING OR HANGING at the POINT OF SALE. Graphics are completely dye sublimated in full color. One tool (included) is all that is necessary for simple quick assembly. 40 MM profile, EUROPEAN PATENTED, extruded in the USA and finished with a clear anodized coating. The printed SEG front panel is produced using our DELUXE KNIT fabric. The back panel is white or black POLYPOPLIN fabric. This frame can be WALL MOUNTED, FREESTANDING OR HANGING at the POINT OF SALE. Graphics are completely dye sublimated in full color. One tool (included) is all that is necessary for simple quick assembly. 40 MM profile, EUROPEAN PATENTED, extruded in the USA and finished with a clear anodized coating. The printed SEG front & back panel is produced using our DELUXE KNIT fabric. 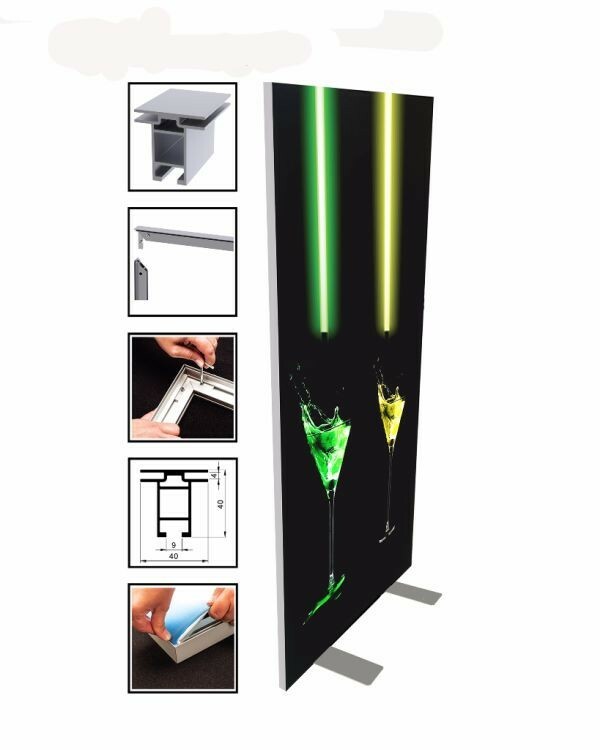 This frame can be WALL MOUNTED, FREESTANDING OR HANGING at the POINT OF SALE. Graphics are completely dye sublimated in full color. One tool (included) is all that is necessary for simple quick assembly. 40 MM profile, EUROPEAN PATENTED, extruded in the USA and finished with a clear anodized coating. The printed SEG front panel is produced using our POLYPOPLIN fabric. The back panel is white or black polypoplin. 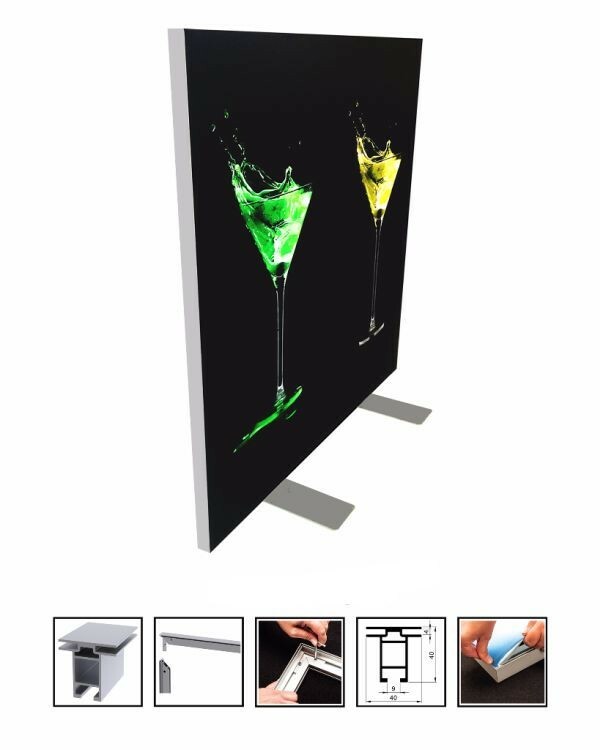 This frame can be WALL MOUNTED, FREESTANDING OR HANGING at the POINT OF SALE. 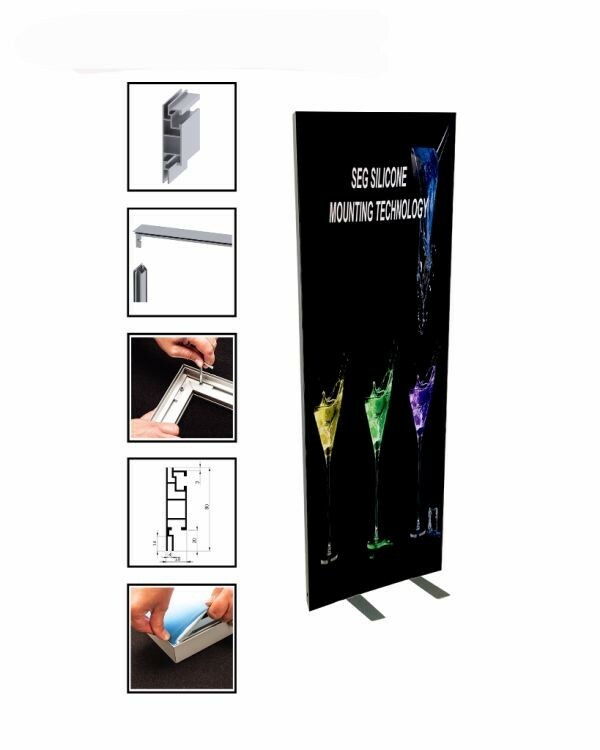 Graphics are completely dye sublimated in full color. One tool (included) is all that is necessary for simple quick assembly. 80 MM profile, EUROPEAN PATENTED, extruded in the USA and finished with a clear anodized coating. The printed SEG front & back panel is produced using our SUPREME KNIT fabric. This frame can be HANGING OR FREESTANDING at the POINT OF SALE. Graphics are completely dye sublimated in full color. One tool (included) is all that is necessary for simple quick assembly. 40 MM profile, EUROPEAN PATENTED, extruded in the USA and finished with a clear anodized coating. The printed SEG front panel is produced using our POLYPOPLIN fabric. There is no back panel. This frame can be WALL MOUNTED at the POINT OF SALE. Graphics are completely dye sublimated in full color. One tool (included) is all that is necessary for simple quick assembly. 80 MM profile, EUROPEAN PATENTED, extruded in the USA and finished with a clear anodized coating. The printed SEG front panel is produced using our SUPREME KNIT fabric. The back panel is white BLOCKOUT POLY fabric. This frame can be HANGING OR FREESTANDING at the POINT OF SALE. Graphics are completely dye sublimated in full color. One tool (included) is all that is necessary for simple quick assembly. 40 MM profile, EUROPEAN PATENTED, extruded in the USA and finished with a clear anodized coating. The printed SEG front panel is produced using our DELUXE KNIT fabric. The back panel is white POLYPOPLIN. 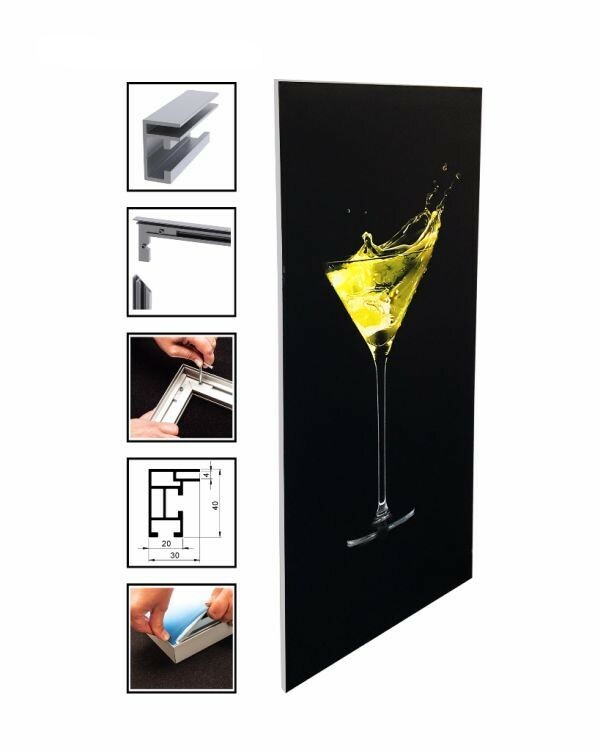 This frame can be WALL MOUNTED, FREESTANDING OR HANGING at the POINT OF SALE. Graphics are completely dye sublimated in full color. One tool (included) is all that is necessary for simple quick assembly.